Modern Oats’ Chocolate Cherry Oatmeal blended with whole rolled oats, coconut, and flax seeds. Stride through your slushy morning and leave your old oatmeal behind. 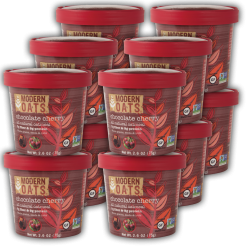 Grab a cup of Modern Oats’ Chocolate Cherry Oatmeal packed with perfect whole oats, flakes of Hawaiian coconut, plump, juicy, antioxidant rich whole bits of chocolate, cocoa nibs, flax seeds, and Oregon cherries to help you put things into HEALTHY perspective. 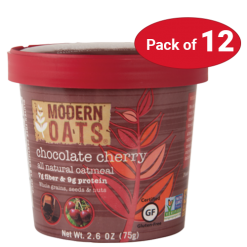 Modern Oats Chocolate Cherry comes in a pack of 12 perfectly sized cups to provide you with all the nutrients you need to start off your day. 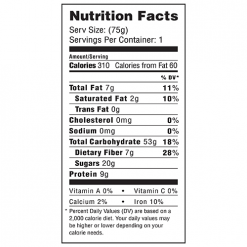 But the benefits of Modern Oats Chocolate Cherry are so abundant that they can just as easily be used as a afternoon snack or taken with you on an outdoor trip.